The trail starts with a crossing of Welsh Creek on a footbridge and then stays in the forest to the north of the creek for about 2 km. There are several sections where the creek has been blocked by slides leaving pools of water. 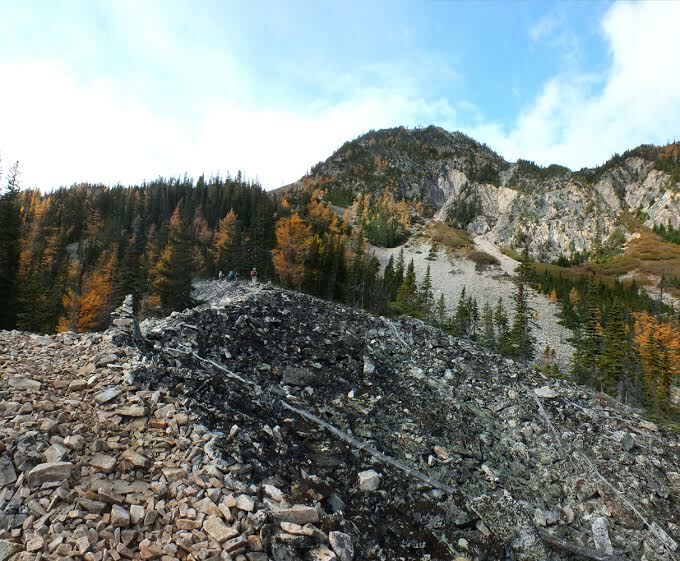 The trail soon leaves the forest behind to climb rocky, talus slopes of varying colours. The trail is well defined but watch your footing on the rocks as this section of the trail is quite steep. At 3 km there is a great view of Welsh Creek cascading into a canyon from above. The trail then switchbacks up through more rocks and rubble to the right of the creek. After another couple of hundred metres, you have arrived at Lower Welsh Lake. There’s lots to explore around the lake or you can continue on to Middle and Upper Welsh Lakes. The trail to these lakes is not well defined. 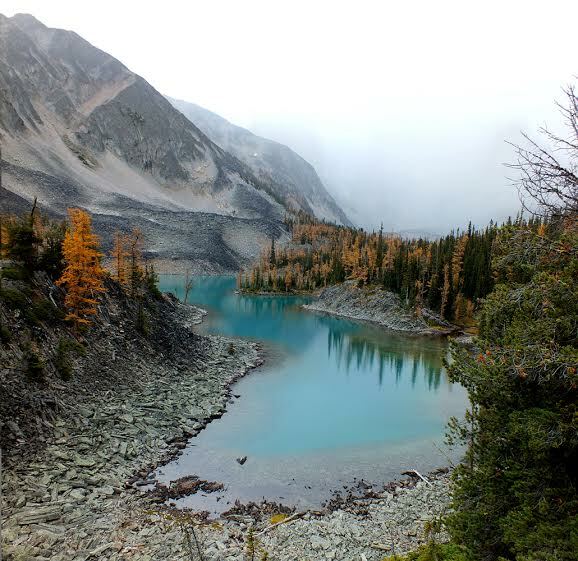 If you are looking for even more adventure, there is a fourth lake you can visit. Aberystwyth Lake is hard to pronounce and hard to get to. The access is from Lower Welsh Lake, but there isn’t really a marked trail and you should be good at route finding if you plan to visit this lake. High clearance vehicle recommended/watch for logging trucks. Set your odometer to zero at the traffic lights on Highway 93/95 at the Invermere junction. Go west into Invermere. At 2.6 km turn right onto Panorama Drive. At 4.5 km just after the Toby Creek Bridge, turn right toward Wilmer. At 7 km turn right onto Main St and drive through Wilmer onto Westside Road. At 17.8 km turn left onto Horsethief Forest Service Road. At 22 km turn right at the Y-junction onto Horsethief Forster FSR. At 27 km turn right at another Y-junction. The road then passes a reservoir on the left and crosses a bridge, stay to the left. At 28 km turn left to stay on Horsethief Forster FSR. At 45.2 km take the road to the left of the sign for the Welsh Lakes trail. This road is steep and narrow, it ends at 47 km at the trailhead. 1.5 - 2 hour drive from Invermere. This trail is actively maintained by the Summit Trail Makers Society in partnership with Recreation Sites and Trails. Please report any maintenance issues directly to them - summittrailmakers@gmail.com.